From 3 March till 6 March the first book in the Nikki Powergloves series will be free. Blurb: Perfect for kids aged 7-10 or advanced younger readers aged 4-6!! Nikki Nickerson hates her name and her boring life as a nine-year-old in the small town of Cragglyville. That is, until she finds a disappearing path into a forest that is rumored to be haunted. At the end of the trail, she and her dog, Mr. Miyagi, find a beautiful treasure chest, standing ready for her to claim. What does the chest contain? Gold? No. Diamonds? Nah. Money? Not even close. The chest contains twelve multi-colored gloves. Nikkiís disappointment quickly morphs into delight when she discovers that the gloves are much more than just a cheesy fashion accessory. You see, each pair of gloves gives her a different power, such as stopping time or super-strength. 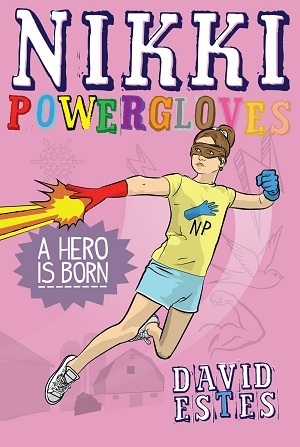 With a little help from her best friend, Spencer Quick, Nikki Nickerson is transformed into Nikki Powergloves, crime-fighting superhero. But every hero needs a villain and she soon finds hers in the form of Jimmy Powerboots, a smug and misguided youth who uncovers a similar treasure and chooses to use his newfound powers for evil. Nikki must find a way to de-boot her arch nemesis and stop his maniacal plans.